Lee Labrada is a legend in the sport of bodybuilding. In his competition years, Lee presented a symmetrical, aesthetic physique that won nearly every top title in professional bodybuilding except the coveted Mr. Olympia. However, Lee was extremely close to winning the biggest crown in bodybuilding, taking a very close second to Lee Haney in 1989 and 1990. Aside from the many titles that Lee won as a professional bodybuilder, it was the class and style he exhibited as a top bodybuilder that grants him the right to be called a legend. Lee was an innovative poser onstage and a professional in every sense of the word both onstage and off. He treated his fans and competitors alike with respect and prepared for each performance on the posing platform with commitment and class. Lee began bodybuilding as a teenager and slowly developed his thick, symmetrical physique. By the time he was 25 years old, Lee won his class at the 1985 NPC Nationals and the IFBB Mr. Universe. It was the latter victory that earned Lee the right to compete as a professional bodybuilder, and what a career he had! Lee won his first professional competition, the 1986 Night of the Champions, shortly after marrying his beautiful wife Robin. Winning his first professional show at a ripped and symmetrical bodyweight of 180 pounds, Lee served notice to all the other professionals on the IFBB circuit that he was a force to be reckoned with. Lee entered his first Mr. Olympia competition in 1987 and placed third behind Lee Haney and Rich Gaspari. Over the next 7 years, Lee would never place lower than fourth in the most coveted competition on the planet. His historic battles with Haney in 1989 and 1990 were extremely close and many feel that Lee deserved to win at least one or two Sandow trophies during his competitive career. Lee retired from bodybuilding competition in 1995 and soon established his own supplement company, Labrada Nutrition. Over the last 8 years, Lee has developed his company into one of the most successful in the industry. Lee and his wife Robin now have three sons and they continue to live in the city of Houston, Texas. "In his competition years, Lee presented a symmetrical, aesthetic physique that won nearly every top title in professional bodybuilding." Lee Labrada used the term "Mass with Class" to advertise his products during his competitive career. It is obvious that the way Lee has conducted his life during his competition years, with his personal life and with his enormously successful business, that Lee defines class and professionalism in all aspects of his life. 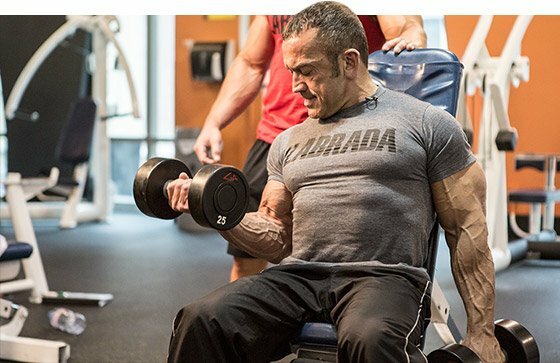 It was an honor for me to talk to Lee recently about his training and diet strategies he employed as one of the most successful professional bodybuilders in history. Lee is very well-spoken and is a perfect representative for the sport of bodybuilding. Lee, since this is a natural bodybuilding website, I wanted to first ask you about your training when you began bodybuilding as a teenager. I remember seeing a photo of you in Flex Magazine from your first contest and, although you took first place in that contest, you were still pretty thin. What type of training program did you follow to progress from those humble beginnings to the awesome physique that won the 1985 NPC Nationals and IFBB World Championships? Well, I entered my first competition in 1978 as a teenager. It was the AAU Teenage Mr. Jacksonville. I think I weighed all of 130 pounds in that show. I started out thin and muscular naturally and then I had to build myself up from there. When I first started out, I was doing the six day a week routines which quickly lead to overtraining. I wasn't eating correctly, you know, eating a lot of the wrong foods and I just wasn't seeing a lot of results. I was getting more muscular but not a lot thicker. "I really started growing when I started going to failure on each set with as much weight as I could." When I finally started growing was when I stumbled across some of the Mike Mentzer high-intensity training articles and I adapted some of his high-intensity principles into my own training. I never did the 1-3 sets per bodypart type regimens that he advocated which was a bit extreme. Especially in those days when we were doing 20 sets per bodypart. Instead, I settled on a system that I found to be very good. Six to eight sets for smaller bodyparts like arms and then for the larger bodyparts, 10-12 sets, maybe even 15 sets for back. Basically, going to failure on each set with as much weight as I could. I really started growing at that point. OK, so you were doing 6-8 reps each set then? Typically, anywhere from 6-10 reps, depending on the bodypart. I do periodize it, in other words, where sometimes I would go with lower reps and other times with higher reps. But, the important thing is to go to failure, to go to the point where you can't do another repetition. It taxes the muscle in a way that it's not used to. How many a days a week were you training at that point, about four? At that time, I was doing a four day split. Basically, training on Monday and Tuesday and then repeating that routine on Thursday and Friday. The way I was splitting it up at that time, which in retrospect was pretty brutal, was chest, shoulders and triceps on one day and legs, back and biceps on the next day. So back and leg day was murder, to say the least. The next thing I wanted to ask you what you do now for your training. I met you at this year's Arnold Classic and I was amazed at the size of your arms. I think you're 43 years old now and you work a lot of hours at your job so what do you do to maintain that size? That's exactly right, I'm 43 and I'm not nearly as big as I used to be but I still stay in real decent shape. Typically, what I do is just brief, inttorense training. So, I'll do 6-8 sets per bodypart these days and the entire workout will take me no more than 30-45 minutes. Lee, let's go back to 1990 when the IFBB decided to drug test the Mr. Olympia. I know you were in favor of the drug testing that year and I was wondering what changes you made in your training to prepare for that show drug free as far as cutting back on the volume of your training or reducing the cardio, etc? Just for the record, I'm in favor of drug testing EVERY year just as long as it's a level playing field. The problem arises that a lot of these substances are hard to detect. So, it's very difficult to have true, drug-free bodybuilding competition, especially on the professional level. But, 1990 just required that I cut back on the total overall volume. I kept eating the same type of food and just allowed a little bit extra time for recuperation. You can see from the pictures that my body didn't really change very much from 1989 to 1990 to 1991. That's because I never was a heavy steroid user. To give you an idea, my contest weight was between 190-195 pounds and today, I weigh between 182-185 pounds. That's where I maintain my bodyweight. Going along those same lines, what are your thoughts on the direction of professional bodybuilding since 1990? It seems like that year could have been a breakthrough year for bodybuilding if the IFBB had continued instituting drug testing. Who knows, maybe bodybuilding would have been one of the sports in the Olympic Games next year in Greece instead of being shut out indefinitely. It could have been a breakthrough year for the professional ranks. I will tell you that on the amateur level, I think that there have been great strides made by the IFBB and the sport has become more popular and has been accepted in more countries through the efforts of Ben Weider and Rafael Santoja and the top IFBB officials. On the professional level, I think that we missed the boat. I think that we had a real opportunity to clean up the sport and make the sport more appealing to the public. There will the pundits that say, "Well, we don't care about what the general public thinks". Well, if that's the case, then don't complain about the prize money never going up, don't complain that there aren't more endorsement opportunities in the mainstream available for professional bodybuilders, etc. Because, at the end of the day, to popularize the sport, it's going to have to be a sport that the public buys into as a legitimate sport. The rampant use of anabolic substances in the sport today is just crazy. It's really gotten worse. Where do you think it's going to go? Well, I think that unless the IFBB comes in and does something about it, it's just going to be status quo. Essentially, you're just going to have these professional bodybuilders taking their physiques to whatever levels possible to whatever pharmacology is available at the time regardless of health consequences. Do you see the trend changing at all with Victor Martinez winning the Night of the Champions and Darrem Charles winning a professional show earlier in the year? Well, I definitely think that those physiques have merit but if you look at the physiques, they are still quite a bit larger than the physiques of the 1980's and 90's and that's fine. Physiques such as Flex Wheeler are beautiful to look at and they display a tremendous amount of symmetry and muscularity and, at the same time, a tremendous amount of size. However that size is distributed is fine. What I'm against is a sport that rewards mass for the sake of mass to the exclusion of all other physical properties of the physique. In other words, there comes a point where, if you keep adding muscle mass, the human body loses its beauty, shape and form. That's what I'm against. I remember when you were competing, you would eat a diet that had plenty of protein and carbs. Now, you hear so much of the current trend where everyone is cutting out their carbohydrates or are eating very low amounts of carbs. Do you think that is necessary in order to get really ripped? No, I think that you do have to manage insulin levels in order to get ripped. That means being able to manipulate carbohydrate intake to the extent, differentiating between complex carbohydrates and simple, i.e. sugary, carbohydrates. Maintaining stable insulin levels is what is key to fat loss from my perspective. The fat intake and the carbohydrate intake is just a function of how much fuel the body needs. And how did you do that when you were competing, just more meals? Yes, typically, I would eat six meals per day with an average of about 40 grams of protein with each meal. I would just manipulate the carbohydrate and fat intake according to my energy needs. I will tell you, in retrospect, that I probably would have fared better on the diet, i.e. had more stable blood sugar levels, if I would have increased my fat intake to 10, 15, maybe as high as 20% fat as a percentage of my calorie intake. Where I used to go down to less than 5% fat by calories and rely strictly on complex carbohydrates for my energy. I think I would have probably have gotten even sharper, in retrospect, as long as those fat calories came from essential fatty acid supplements such as flaxseed oil and things like that. Do you remember what the numbers were Lee, how many calories you were eating, the grams of protein, carbohydrates and fats for when you were competing? Like I said, 40 grams of protein per meal and the balance of that was made up of complex carbohydrates and vegetables and I would say I was on a 3500 calorie diet during the off season and it would go as low as 2500 calories a day before competitions. How about bulking up? Did you allow yourself to bulk up in the off season and, if so, how heavy did you get? I did between the ages of 17-21. Once I started competing in the men's categories, I never let my weight go up more than 10-15 pounds over contest weight. I think it's counterproductive. I think it's hard on your body, it's stressful and it's not conducive to greater muscle gains. Lee, let's go back to your competitive days as an IFBB pro. There were several shows that you did that really stand out as far as your outstanding condition. The 1985 Mr. Universe is one, the 1989 Mr. Olympia in Rimini, Italy where you took second to Lee Haney and the 1992 Mr. Olympia in Helsinki, Finland. Looking back on your career, which one show do you think you displayed your most impressive condition? That's a good question. I would have to say that the 1989 Olympia in Rimini and the 1992 Olympia were probably my best competitions in terms of conditioning. Well, the biggest difference in those early years was that I had gone on to using meal replacement powders in addition to the normal animal proteins such as chicken breast and fish, etc. I started using powdered protein and I think that just because the powered protein is mechanically ground down, it's finer and it allowed for a better absorption and a higher quality of protein and I think that had a lot to do with it. So, you think it was more a function of the protein powders than the training that allowed you to increase your size so dramatically? I think that there is no doubt that it was a function of the nutrition. As for the training, of course I kept increasing the amount of poundages that I used but it was a function of nutrition. Speaking of that, let's talk about your poundages that you used in your training. Did you concentrate on going very heavy or just on feeling the muscle? More on feeling the muscle. I was one of those bodybuilders that never had trouble developing bodyparts evenly. I would consider myself a slow to mid gainer. I was not a fast gainer nor was I an extreme hard gainer but I wasn't one of these super humanly strong bodybuilders like Ronnie Coleman. He is practically as strong as a powerlifter is, pound for pound. I used enough weight to fatigue my muscles. Was that really important for you to go heavy in your workouts? Yes, because I wanted to be able to take the muscle in the 6-10 repetition range to the point where I would fail on the last repetition. How much cardio did you do during your years of competition? Some bodybuilders will do cardio as much as six days a week, twice a day while others will only do cardio three times per week. Did you feel cardio was necessary in order to get really ripped? I think cardio is a good aid. I didn't rely heavily on cardio. I've always had a pretty fast metabolism and my cardio consisted of 20-30 minutes, five days a week. How about in the off season, did you do any cardio then? I typically didn't do much cardio in the off season. Two to three times per week. You've competed against some really awesome bodybuilders during your competitive career in the 1980's and '90's. Out of all the outstanding pros you've faced, which one do you think was the most genetically gifted? I would have to say Lee Haney or Flex Wheeler were the two most genetically gifted bodybuilders that I've competed with. Lee Haney was in just in a class by himself. He was an incredible bodybuilder with a lot of God given talent there. I would say that Flex Wheeler, you know it's a tragedy that he didn't become Mr. Olympia at one point. Because I think it might have changed the direction that bodybuilding has careened down at this point. I would say that those are the two most talented and genetically gifted bodybuilders that I've competed with. I would have to say that from a persistence standpoint, the name that comes to mind is Rich Gaspari. Rich is a great athlete and, at the same time, he took less than perfect genetics and, boy, he just ran with it. He made the best of it just from hard training and from sheer will. How about the one competitor that stands out as the mentally toughest? I would have to say Dorian Yates. You know, he didn't talk much. I think, that of itself, was such that you knew he meant business. Along those same lines, which one of the competitions that you competed in stand out as some of your toughest battles? Oh, undoubtedly, the battles I had with Haney in '89 and '90. I would say that if it came down to one, it would be the battle that I had with Haney in '90. You know, at the time, after the pre-judging of that show, I was ahead by several points going into the night show. Then, he defeated me by two or three points. It was a hard loss to swallow. It was a real turning point for me also, both from the bodybuilding and the professional standpoint. Up to that point, I had really externalized my ambition to win the Mr. Olympia crown and, at that point, '90 was a turning point for me personally because it was in that year that I realized that I needed to focus not on winning the Mr. Olympia crown but basically in improving my physique and the Mr. Olympia crown would be won as a result of that. It was a shift in focus and, because of that, I was able to get greater gains out of my body and, secondly, I was able to enjoy myself a lot more. I wanted to ask you about your company, Labrada Nutrition. You seem like the kind of person who plans for success instead of just winging it or taking it year by year. I remember reading in a magazine article years ago that you said you planned on competing as a pro for 10 years and then, when those 10 years were up, you retired. 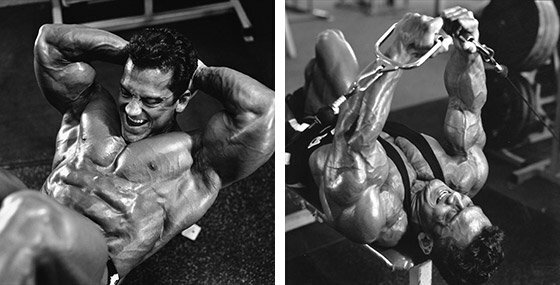 You didn't deviate from that, you didn't make a comeback like so many other bodybuilders do. John, I can tell that you love bodybuilding. I don't think anyone else would remember that. In fact, that's the first time in an interview that anyone has mentioned that. But, you're exactly right. I did say that. When I married my wife, at age 26, I told her that I was going to be in this sport for exactly 10 years. I would retire at 35 because if I had not won the Olympia by that time, I wasn't going to. Low and behold, 35 came around and, I knew, I just knew it was time. And it was good because by knowing what your exit strategy is and when it is, it allows you to live more fully. It allows you to plan and you just get so much more out of the experience when it's planned like that. Did you have a plan, Lee? Did you know that you were going to run your own nutrition company? I knew I was going to run my own nutrition company as early as 1993. 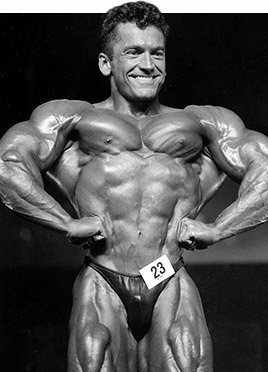 In 1993, I was at a bodybuilding show where I was giving an exhibition and I ran into Dale Ruplinger who was a former middleweight Mr. Universe. I saw him selling some vitamins and some supplements for another company and I got to talking to him and the bug bit me. I knew at that point that there was a future in that. Earlier, as early as 1991, I had been approached by Bill Phillips about a relatively obscure product at that time called Met-Rx. Low and behold, it was a matter of being in the right place at the right time and I signed on with Met-Rx. It was myself, Bill Phillips, Scott Connelly and Jeff Everson at that time and it went through the roof. The product became wildly successful and I saw that there was an opportunity for me in business in the supplement industry and that there were opportunities for good companies with good products because the supplement industry was still in its infantile stage at that point. As the owner of your own company, which products do you offer from Labrada Nutrition that you feel would be of particular benefit to a competitive, natural bodybuilder? Undoubtedly, the meal replacement powders because, let's face it, it's tough to eat six times a day. I don't care what anybody tells me. It's tough to carry a cooler around with a lot of chicken breasts and potatoes and other things in it and a good bodybuilder will do that. It's just so easy to use meal replacement powders as an adjunct to a whole food diet. So, I would say the meal replacement powders, the Lean Body, in particular. The bars are good in a pinch, particularly after training. You can just throw them in your bag. We've got the new Lean Body Gold Bars which are wonderful. Then, I would say the glutamine and the creatine are important when you are competing and we carry both of those as well. Lee, what did you take when you were competing as a competitive bodybuilder? I would take as many as three meal replacement powders per day, sometimes as many as four per day and I would take creatine with that. What does the future look like for Lee Labrada as far as your company goes and for you personally? Oh, goodness, I'll tell you what, the sky is the limit! We're expanding, we're growing and getting into more outlets and developing a larger fan base. As you know, I have the Lean Body Coach Newsletter which is a free weekly e-magazine that I send out to over 50,000 people. It's a magazine that provides nutrition, training and supplementation tips from some of the best writers in the world on these topics. "We're expanding, we're growing and getting into more outlets and developing a larger fan base." I've been busy working with the City of Houston as the fitness czar for the city. I was appointed fitness czar by Mayor Lee Brown in June of 2002 to head up all of the initiatives here for the city of Houston to raise awareness about the need for exercise and nutrition and to combat obesity. We've been doing a lot of consumer advocate work there. Finally, I've recently signed a six figure book deal with Harper Collins and I'm going to be coming out with a book in January of 2005. Wow, that's great Lee. Thank you so much for the interview and best of luck to you with Labrada Nutrition, the City of Houston and we all look forward to checking out your book in 2005! I am a 2 time Mr. Universe winner and a full-time devoted fitness advocate!